What actually happened during the Dhulagarh riots? Walking through the BJP stronghold of Dewan Ghat, it was clear that the communal polarisation had done irreparable damage. A few kilometres off the Kona expressway in Howrah district of West Bengal, our car is ground to a halt by a small crowd on the road of the sleepy Dhulagarh town. A motley group of women, supported by some men and young boys, are trying to block the road, demanding release of Hindu men detained by the police. 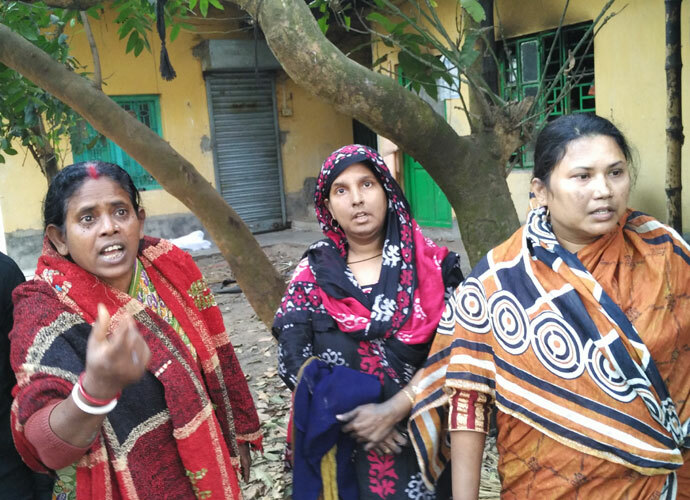 “Houses of Hindus were attacked and burnt; and now people who are helping us, feeding us are picked up by the police,” echoed several agitated women as we reached the spot. 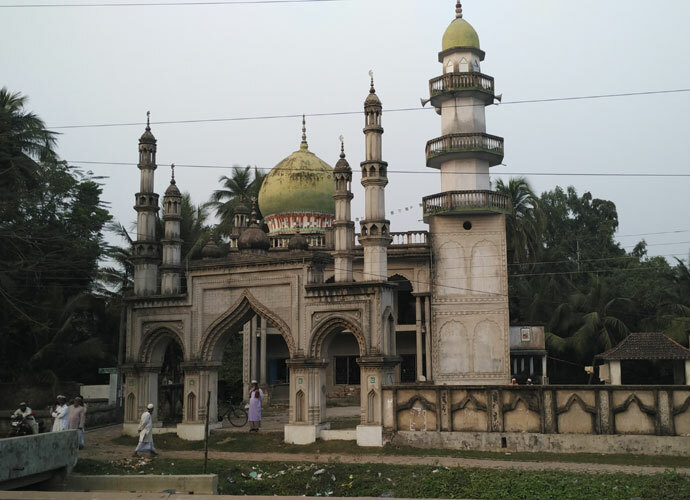 A small town in the Howrah district, barely 30 kilometres from Kolkata, there is still palpable tension in Dhulagarh on the last day of 2016 after communal riots erupted on the occasion of Eid Milad-un-Nabi on December 13. The basic facts on which there is unanimous agreement are that on December 13, the procession to mark the birth anniversary of Prophet Muhammad had arguments and apparently stones were pelted on them near the Annapurna Club at Dewan Ghat. What followed was arson and pillage of houses and shops nearby. 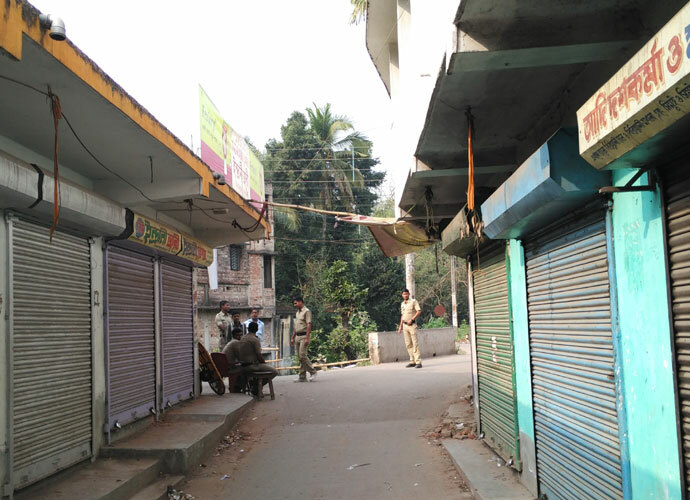 Next day, the unrest spread to some other pockets, mainly to the Hindu-dominated Pollepara and Muslim-dominated Munshipara localities a few kilometres away, despite deployment of police and Rapid Action Force (RAF), resulting in looting and burning of nearly 100 houses and shops. The majority of houses and shops belonged to poor Hindu and Dalits but also, many houses, shops and embroidery workshops of Muslims were razed. Many vehicles were torched although fortunately there was no casualty. On what triggered the riot and why it continued for two days despite deployment, there are several versions of the story, all of which clearly appear motivated. 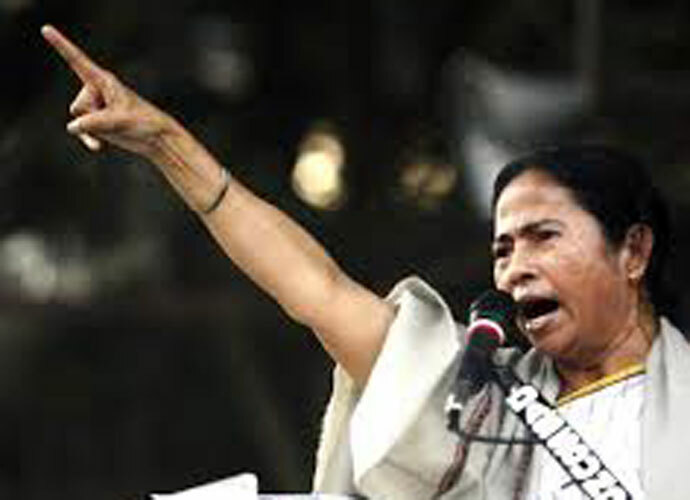 Chief minister Mamata Banerjee has on record termed the incident as a “local problem” and a “small matter”, accusing the media of making a mountain out of a molehill. “In the last 15 days, social media has been running wrong information on an incident which did not take place at all,” she added. No doubt, the social media is playing a dangerous game as some of the pictures circulating on it and attributed to Dhulagarh are old photographs taken elsewhere. But if police forces are stationed at different junctures - as we witnessed - even two weeks after the incident and there are reports that they may remain for a few more weeks, certainly something serious happened. 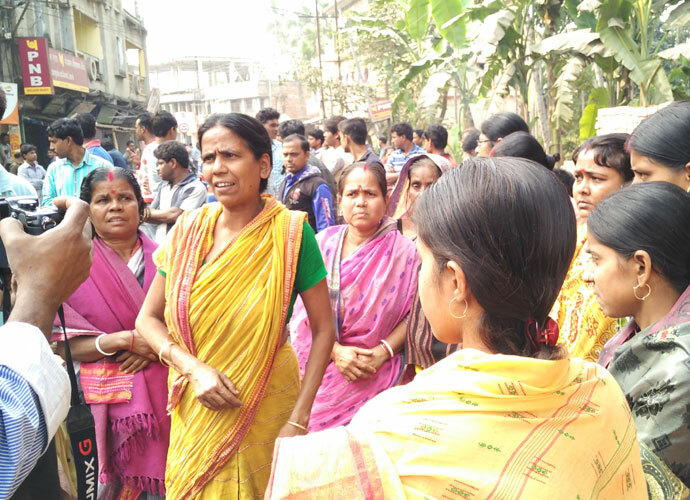 To see for ourselves, we left our car near the Dhulagarh main road and decided to walk towards the neighbouring localities of Pollepara and Munshipara. Almost all the shops on the street leading to the village off the Dhulagarh road were closed; the window panes of some houses were broken, while broken bricks were seen outside many others. On a crossing, there was deployment of police force and they stopped us from proceeding further despite several requests. We were told we needed to get permission from senior police officials before we would be allowed in. After provocative reports by some national media outlets, the state government has cautioned against any media professionals visiting the localities. Section 144 is still in place. Disappointed, we decided to walk the other way and spoke to a few people on the way. As people got to know that we were from the media, they asked if we were from Zee News. 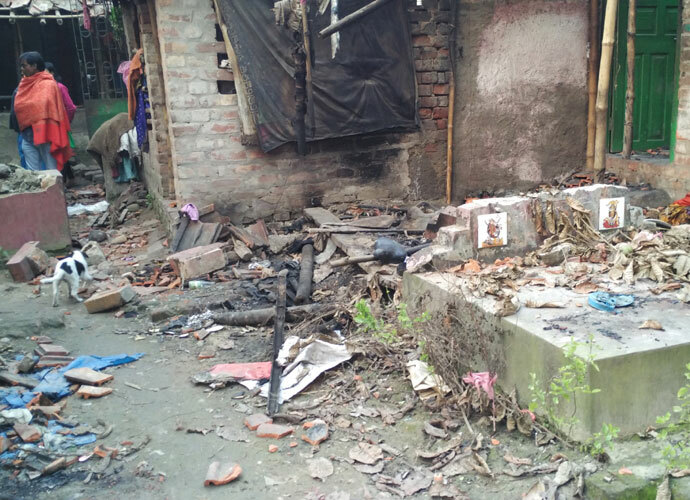 Strangely, the arson that occurred a few kilometres away in Dewan Ghat did not spread uniformly; only a few clusters here and there, that too a few kilometres away from Dewan Ghat, have been attacked while the surrounding localities of Hindus and Muslims appeared largely untouched. This clearly points to targeted attacks from both sides. Yet most TV channels, Zee News, Times Now, India Today, etc. preferred to highlight that only Hindus' houses were attacked by “anti-social elements belonging to a particular community”, adding fuel to the fire. As we reached the main road on the other side, we found a police picket stationed here as well. Meanwhile, the news of us walking and enquiring about the incident seemed to have spread; and few middle-aged men asked us who we were and what we intended to do. Once we could build trust, they agreed to take us to the torched shops, avoiding police checkpoints. The narrow bylanes of Dewan Ghat declared to us on face that only one party holds sway here - the BJP. A group of old men and young boys gathered around us near the market at Dewan Ghat where most of the shops were burnt. Sushil Das had a grocery shop and an adjoining warehouse that was turned to ashes on December 14. “The police made us clean the burnt shop today morning,” he claimed. Another person, Prasanto Das, showed us his shop on the other side of the road. “I had a furniture shop, we had to deliver a bulk order in a few days and hence had ample furniture,” he said. A few shops at a stretch were burnt here while four others - one of a Muslim and three belonging to Hindus - were left untouched. Around five shops, a few meters away, were also torched. Villagers claimed the mob came on bikes, about a few hundred, throwing bombs. They were allegedly also carrying swords in hands. 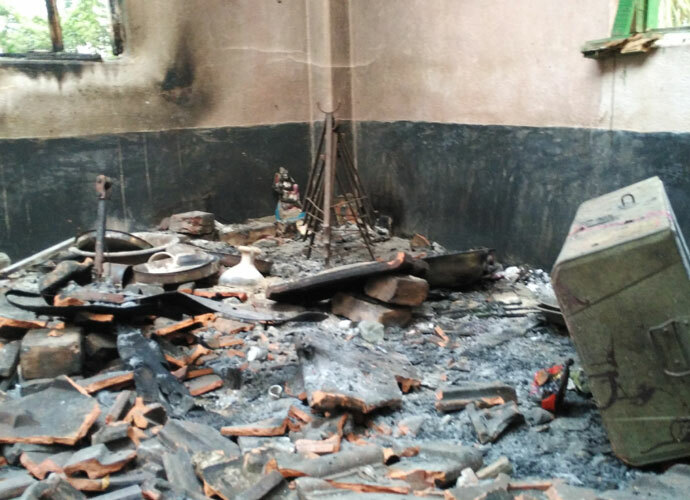 It may sound awkward to outsiders, but the use of country-made bombs and pistols is not unusual in West Bengal where political violence is rampant. Many villagers alleged that although some local men were also there, most were outsiders. 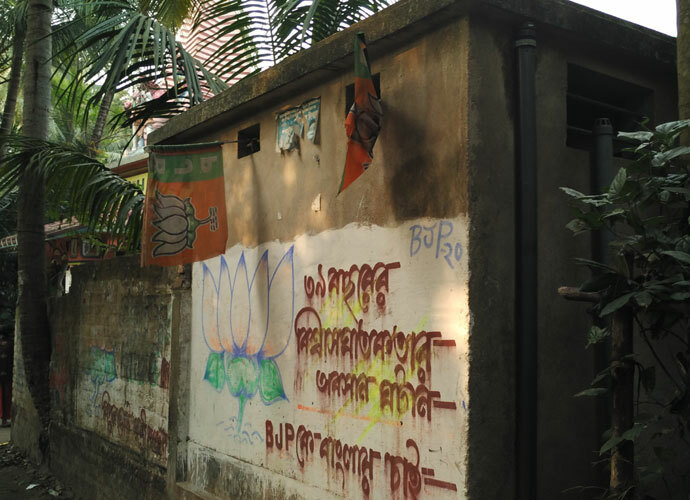 Meanwhile, BJP leader Rupa Ganguly has accused the TMC MLA from neighbouring Panchla constituency, Gulshan Malik, of inciting the mob, although he has denied the charges. As we moved ahead, we saw a computer shop belonging to a Muslim damaged and looted. Nearby four embroidery workshops, all belonging to Muslims, were burnt. They each had a big machine that has been damaged now. Two women, Zarina Begum and Chanda Begum, along with a young boy and a girl, were collecting whatever little was left off in one of the workshops. Zarina said she was the sister of Sheikh Jamaluddin and Azharuddin and they each had their workshops. Chanda is her sister-in-law and the mother of two children. “Our factories have been burnt, machines worth lakhs have been destroyed and now the police have charged our brothers and nephews with participating in violence,” Zarina said. One of her nephews too has been detained by the police while her brothers are in hiding to “avoid police harassment”. “How would we know if the rioters were Hindus or Muslims, locals or outsiders?” Chanda asked, when we probed further. One Taposi Das intervened, “The attackers had their faces covered,” she said, gesturing with her hands. Her house is behind one of the workshops and her husband Ramesh Das had a cycle repairing shop in the market. “Our shop was damaged but the police have now accused my husband of participating in mob violence,” she added. 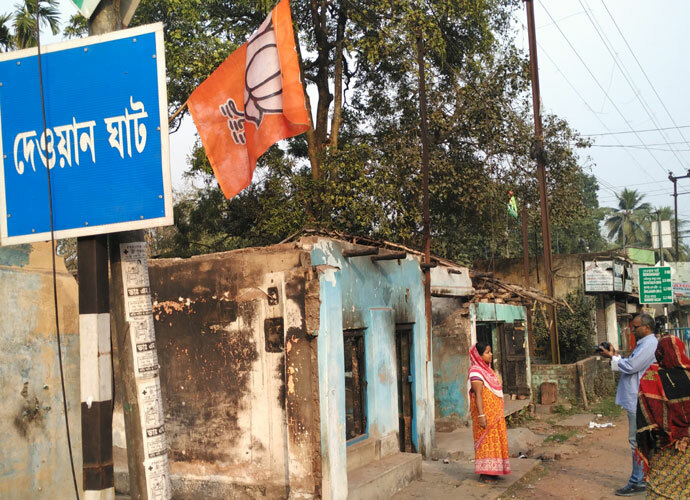 As we were walking through the narrow lanes of the village leading to Dewan Ghat market, it appeared that the communal polarisation has done irreparable damage to a constituency that had been a TMC stronghold till now. But here, for a few moments, as these women spoke among themselves, referring to each other as Didi and finding succour in the losses they had suffered, I still had hope! 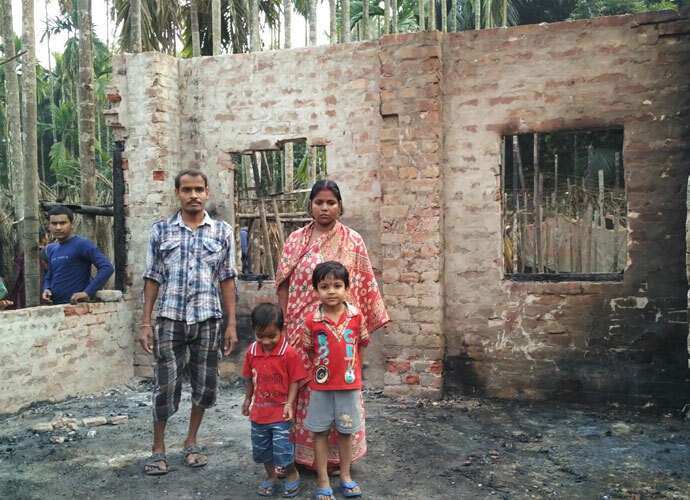 We next saw a cluster of seven-eight huts of scheduled caste Bhuiya families in Jayrampur on the other side of the road, about half a kilometre away, that had been burnt down. Interestingly, the house of a poor Muslim family next to the cluster was left untouched here. We finally reached the Annapurna Club, from where the conflict had allegedly begun. The club was locked and still had hundreds of brick pieces scattered around. A small flag of the BJP hung on its roof, so did around 5-6 more saffron flags on different poles surrounding it. There is no evidence that such a slogan was given, however, that did not stop India Today and other channels from reporting it. “We have been living together but they called in outsiders and attacked our homes and shops,” another woman said. A little later, one of the young men pointed to the “Pakistani flag”, adding, "this is the root of the problem”. It was the green flag that Muslims associate with Islam and had hung on the occasion of the Prophet’s birth anniversary. In fact, on Google Plus I found a photograph posted in December (presumably during the celebration of the Prophet’s birthday) of the local mosque with several green colour flags with a crescent, but it has nothing to do with Pakistan. The owners of some of the embroidery workshops in Dewan Ghat live here and have built two storied houses as they earned money. One woman showed her house and claimed that the mob threw bombs at their houses as well. Those whose houses were burnt were forced to move out and after the riots, the police started detaining young men from both communities. Hence, those villages were almost deserted, giving some news channels a reason for provocative headlines such as “forced exodus”. As we went, we found that women and children are slowly coming back but most men are still at large. The police have meanwhile arrested nearly 60 people in connection with the riots, including a local don Saddam. The government has also distributed cheques of Rs Rs 35,000 each but villagers say it is insufficient. 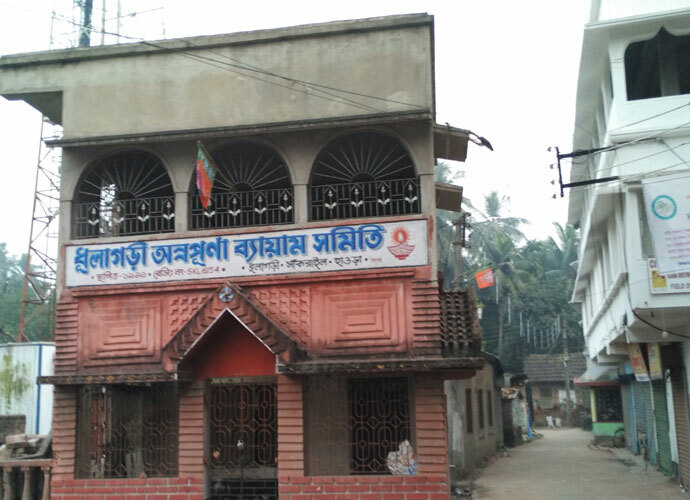 Although Howrah district has seen sporadic communal incidents in the past, Dhulagarh was normal till last this December. The riot has broken the harmony of this largely working class locality. Suddenly there is acute distrust among both communities and neighbours are suspecting each other, barring a few. We noticed this when we moved from one locality to the other, as villagers would nudge us to not go “that side” and “those people”, and immediately begin to suspect us. As some of them have earned money, Muslims in the state have become more assertive; and thus we see bigger processions on Eid Milad-un-Nabi now. Clearly, that is creating discomfort among a section of people. Surprisingly, however, Muslim leadership of the state has largely remained silent and done little to ease the communal tension in Dhulagarh so far. Such processions clearly need some regulations and the Muslim leadership needs to come forward to make sure that no untoward incident occurs during religious gatherings. Unruly processions, communal tensions, coupled with ineffective leadership will cost the state, Muslims in particular, incalculably in the coming years if not checked now. The writer is a journalist who also shares his knowledge with young minds as an assistant professor of media communication at Aliah University, Kolkata.